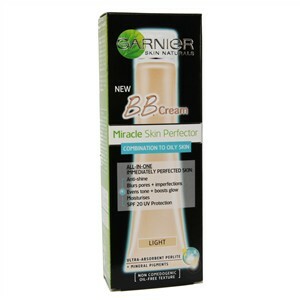 Garnier B.B. 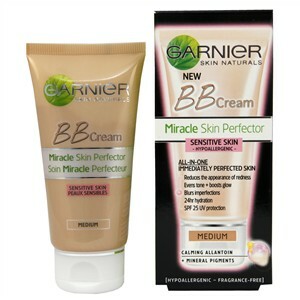 Miracle Skin Perfector is a facial cream that combines moisturiser, foundation and sunscreen. It has two types: Original B.B. cream for normal skin, and Oil-free for combination to oily skin. It's perfect for everyday use if mainly your goal is to even your skin tone. It has only one negative side to it, and that is - it only has two shades, Light and Medium, and you really don't have a wide choice to do, since the Medium is very dark and the Light one is very pale. I took the Medium shade, and even though i have a normal skin, i took the Oil-free by mistake. Actually, i don't know what was i thinking, i think i took that one because the texture seemed lighter. ~ So, here's a trick a did to adjust the cream for my skin type. I mixed it with a hydrating cream that i use, it's from Avon naturals - peach and cotton. This works, since i don't have problematic skin, i don't have anything to cover. If that's not the case with you, than try mixing equal amounts of the two creams. The original Garnier B.B. cream has SPF 15 UV Protection, and the Oil-free has SPF 20, which is really good, since we all know UV light is very bad for the skin. Even though the Garnier B.B. Miracle Skin Perfector it's very light, not like other foundations, it still corrects blemishes, and gives really nice healthy look to your face. If the shades are not fitting for you, you can buy both of them ( if the price is okay for you ) and mix them together. I know that it seems like a lot of work to do, you know - buying the two shades or mixing it with hydrating cream, and you kinda ask yourself - Why bother? Why not buying some other product that is going to give me everything i need, all together? Well, for me, it is worth a while, because the final result is VERY satisfying. samo da te prasham za suva kozha odgovara? таа јас што ја зедов, Oil-free никако за сува кожа! исклучиво за мрсна. премногу ја суши кожата, јас се зезнав што ја зедов, како што пишав погоре :)- ама ете се снајдов ја измешав со крема за лице и сеа е таман. ама онаа другата(на левата слика), иаkо е за нормална кожа мислам дека би била океј за сува кожа, ама на претходно нанесена хидратантна крема. nice post! thanks for your comment. Your blog has been accepted in Europe Rep of Macedonia n°19 a minute!